Housing Secretary Ben Carson Clarifies Comment That Poverty Is A 'State Of Mind' But Carson says that "how a person thinks" is only one component that contributes to being poor. He spoke to NPR about the comment and how his agency hopes to "break these cycles" of poverty. 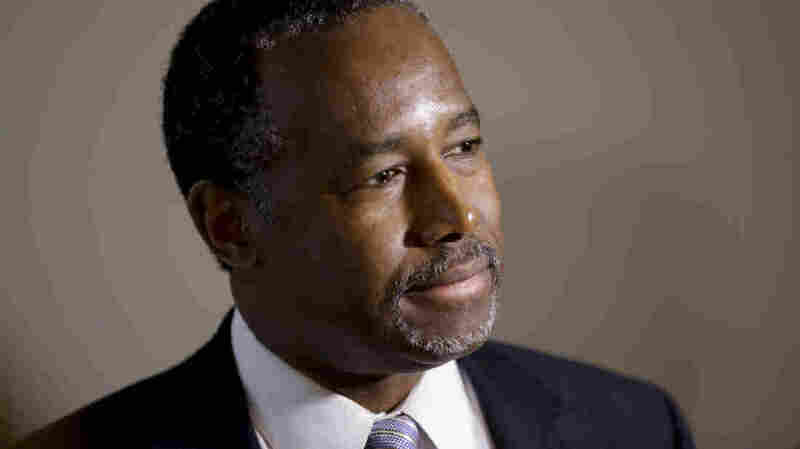 Housing and Urban Development Secretary Ben Carson drew controversy last month when he said in a radio interview that "poverty to a large extent is also a state of mind." Carson, who grew up in poverty, said in a Sirius XM radio interview last month that "poverty to a large extent is also a state of mind." The comment drew widespread criticism from anti-poverty advocates who say it implies that poor Americans are at fault for their poverty and that they're better off without government aid. Carson is scheduled to appear before a House appropriations subcommittee Thursday to defend President Trump's 2018 budget request for his agency. Carson will likely face tough questions about his comments on poverty as well as the administration's proposal to cut more than $6 billion — or 13 percent — from HUD's budget. Among the programs targeted: public housing, housing vouchers, community development block grants, and other aid for low-income Americans. The administration argues that much of this spending is ineffective and inefficient and that the money would be better spent elsewhere. And Carson tells NPR his agency's approach is aimed at breaking cycles of poverty long term. Housing advocates say the cuts would be devastating for millions of Americans who can't afford a place to live without assistance. You made these comments about poverty largely being a state of mind. Can you explain how much you think a "state of mind" accounts for somebody being poor? You know Americans are industrious people. That's how America got to be a great place. We're not a little feeble people who have to be spoon-fed. What I said is that it is a factor. A part of poverty can be the state of mind. Poor in spirit. And people tend to approach things differently, based on their frame of mind. A good example would be, if you were a minor league baseball player, and you were brought up to the majors and you look up on the mound and you say, "Nolan Ryan! Oh no, he's a legend. He's got a 100 mile per hour fastball. I'll probably not even see the ball." You're probably not going to get a hit. If you come up and say, "Nolan Ryan. He's an old man. I'm going to knock the cover off the ball," you are probably going to have a much better chance. So one of the things I think government can do very well is to help create the right kinds of mindset, frame of mind, by providing ladders of opportunity so that people can really see what's going on around them. A lot of times if you go to a disadvantaged neighborhood, you ask the kids, "What do you want to do when you grow up?" You get about five different answers. But there's a thousand. We need to show people the other 995 and how you get there. And those are the kinds of things that create that can-do attitude that is so important, and that for such a long time was a part of the American mindset. And there are those now who want people to think that somebody else is in control of you and that you're a victim. We want to find ways to make sure that people understand that the person who has the most to do with what happens to you, is you. I want to make sure I'm clear. You're saying it's only one component of people being poor, or the main component? So what are you going to do at HUD to give people what you say is the right state of mind to get out of poverty? A number of things, but one of the interesting concepts we're working on are centers that will be put into neighborhoods, repurposing some of the old buildings, and exposing people to what those many opportunities are, exposing people to some basic skills that people used to get, for instance in high school, creating mentorship programs. There are a lot of people out there who would be delighted to take people under their wings but they don't have a good mechanism for doing that. (And) to provide day care for so many of the young ladies who end up getting pregnant and then their education stops. Provide them a mechanism so that they can go back and get their GED, get their associate's degree, their bachelor's degree, their master's degree, take care of themselves and teach their children to take care of themselves, so that you break the cycles. The systems that we have been using for decades don't seem to be breaking the cycles. They seem to be adding to them, so we have to start thinking a little bit differently about these things. But these centers aren't included in the president's budget. So how are they going to come about? Is this something HUD is going to do? Yeah, these are things that we're working on. We're working on concepts, on how do we break these cycles, not how do we continue them. So many people just are focused on, but if we change this, then it won't go on like it always has, but maybe we don't want it to go on like it always has. We have three to four times as many people in need of affordable housing as we can provide. The more we can move out the more others we can help. Success is not how many people we can put into public housing, it's how many we can get out of it. The president's budget, though, calls for tremendous cuts in the HUD budget. You told the National Low Income Housing Coalition that nobody would be thrown out on the street under your watch. But many analysts look at those numbers and say that people will be thrown out on the street under this budget. Are they wrong? I think [analysts are] wrong, absolutely. We're paying very close attention to the vulnerable population and making that a very important part of how things are executed. Bear in mind, there are a lot efficiencies that will save us a lot of money. And there's also a new model that we're really concentrating on. The old model was the federal government rides in on the white horse and plops down millions of dollars and says, "Build this place for all these people." And then goes on to the next project. The new model is the federal government seeds the project, and oversees and facilitates, along with the housing authorities, ... bringing in those private partners, bringing in the nonprofits, bringing in the faith community. And there's a lot more money there than there ever could be in the federal government. And you also get those people vested in the project, so now their income stream is dependent upon that project being successful. And having that done at the local level is going to be so much better. So you don't think anybody's going to be thrown out on the street? I don't think anybody's going to be thrown out on the streets. We're paying very careful attention to that. Los Angeles County [has] reported that its homeless population went up 23 percent last year, which is an amazing number. But this budget calls for cuts in homeless assistance. Do you think we're going to be seeing increases in homelessness in lots of other places? I don't think so. Of course, the other part of that story is a number of places, like Bergen County [N.J.], have reported there's no homelessness there. It's been eradicated. We're going to continue to make that a high priority, fully recognizing that it actually costs more to leave people homeless. That person sleeping under the bridge who's going to wind up in the emergency room, sometimes getting admitted for a week in the hospital? That week hospital stay costs more than it costs to put them in a place for a year. But putting them in a place is not enough. That's only Part 1. Part 2, we have to diagnose why they're in that condition. And Part 3 is we have to treat it. There are a number of things in the president's budget to encourage home ownership, but we have many millions of people in this country who aren't even close to that point. What's in the budget to help them? For one thing, people are closer to it than you might think, but it's a matter of making sure they're educated properly. A lot of times people maybe bite off more than they can chew. And that's one of the reasons, for instance, that we are now looking at being able to guarantee mortgages on individual condominium units. Because that can frequently be the first step. You buy that kind of home, you build up equity, you save, and then you move to the next step. In 2008, there were so many people who deceived individuals and simply said you've got an ever expanding price here. It's going to be your piggy bank for the rest of your life. And you can always count on that. And look what the results of that were. So we're working to make sure that the education of the people is such that they understand how you go about building that equity, and how you go about making your first, second, third steps to acquiring a home. Because, quite frankly, in America ... the primary source of wealth is home ownership. How are you going to educate people? We have multiple places around the country, more than 1,200, of individuals who are trained ... and we're working with them. We're also looking at some uses of social media and the Internet to help keep people well-informed on how to do things. Giving them little quizzes that they can take, and things of that nature. It's really just a matter of making sure people are well-informed. You know Americans are industrious people. That's how America got to be a great place. We're not a little feeble people who have to be spoon-fed. But we do have to recognize where we are right now and utilize what we have in order to help facilitate the use of the tremendous intellect and energies that exist within our society. But there are some people who you would say are poor, who might want to try but they can't get out for other reasons besides their state of mind? Of course, there are people of all types. But our duty in government and in HUD is to provide the avenues, the mechanisms, to allow anyone who can get out to get out, and I think that's going to be most people.